I visited the Fountain Art Fair opening day (3/7/14). It’s one of many mega-shows during NY Armory Week in March each year. Fountain Art Fair was founded in 2006 and is also the site of the original historic Armory show (1913), at the downtown 69th Regiment Armory, Lexington Avenue and 26th Street, NYC. In my opinion, one of the best, and most interesting art installations at Fountain was the two-person booth with wood sculpture by Donna Dodson and Stephan Fowlkes. This is the 3rd year the artists showed together at Fountain. The image above is my photo (a partial view) of their booth this year. Dodson’s works are the sculpture on pedestals. 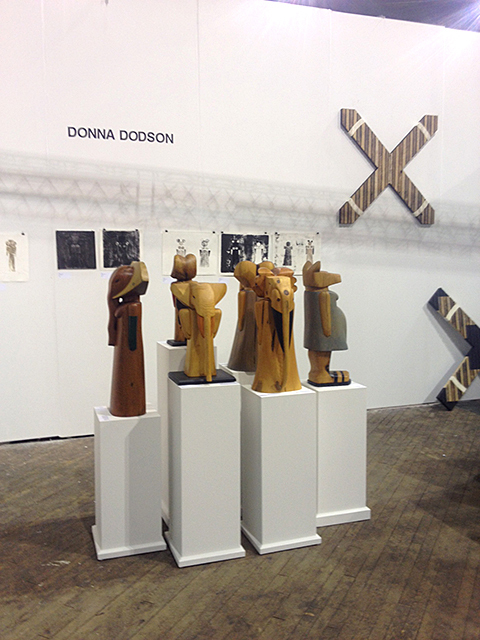 Fowlkes’ works are the large geometric wood crosses on the wall behind Dodson’s sculpture on pedestals. I thought their installation was one of the best because it showed two complimentary approaches to wood and mixed media. Concept and craft were exquisite – combining art works that are both timeless and contemporary. I stopped and talked to Donna about her work. 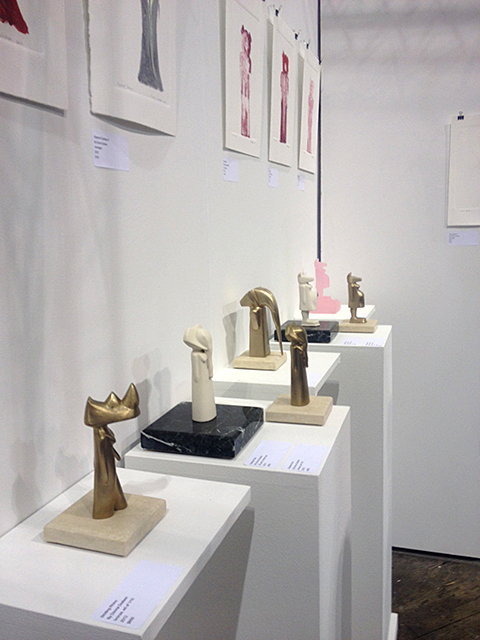 Dodson carves wood sculpture and casts small sculpture (variations) in bronze, glass and as 3D computer prints. Fowlkes works with reclaimed lath, plywood and mixed media. See more work by Donna Dodson here. See more work by Stephan Fowlkes here. See more information about Fountain Art Fair here. Read the review SelavySays: Donna Dodson here. 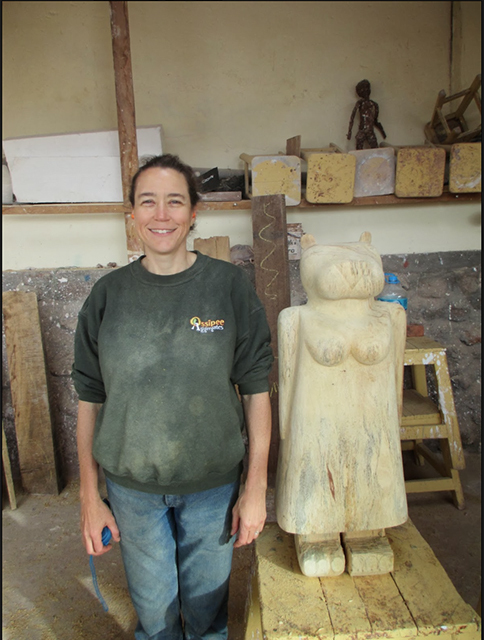 The image above is Donna Dodson at a recent residency in Cusco, Peru. The sculpture you see is still a work in progress. Read about the residency here. 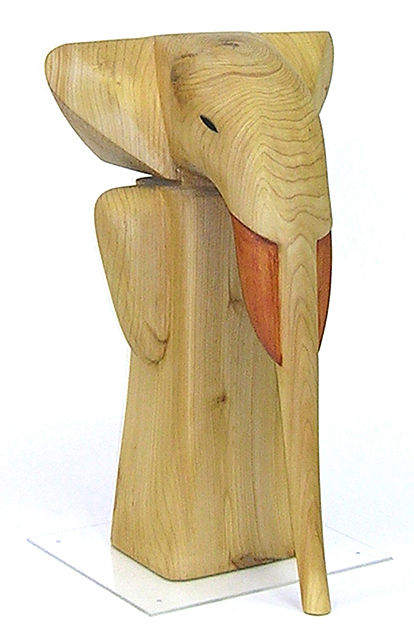 The image above is titled Asian Elephant, 32” tall, wood, paint (2007). See it facing left in the first photo above showing Dodson’s sculpture on pedestals. Notice the beautiful grain in the wood and the curve of her shoulders and soft breasts. Notice this female elephant has no tusks. And see her painted black gloves and golden blond hair that crowns her head. How lovely. 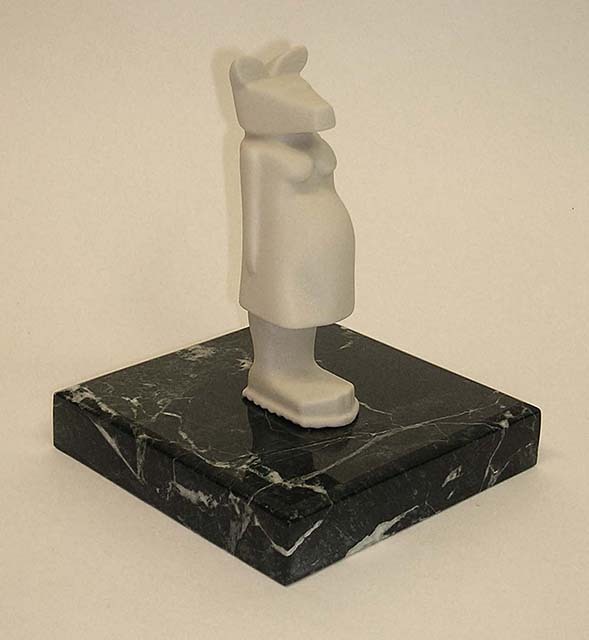 The image above is a small version of Pregnant Kangaroo, a 3D computer print on a marble pedestal, 6” tall, edition of 10 (2010). The image above is my photo of Dodson’s small bronze, glass and 3D computer printed sculptures on pedestals seen at Fountain this year. Notice the works on paper hanging on the wall above the small sculptures. Dodson explores her imagery in many different media, including drawing and printmaking. I told Dodson the two small white sculptures appeal to me, and remind me of ancient marble Cycladic art that I’ve seen at the Metropolitan Museum in NYC. I love the scale Dodson has created for these works. The size is so appealing. The image is so Classic. I especially love the pink glass sculpture seen on the right side. Dodson says her sculpture is inspired by African art and Native American totems. I asked her to tell me how she works with wood. She said she learned the ancient art of wood carving by apprenticing with a master carver and has worked with wood since 1996. She currently has two series of carved wood sculpture titled Elephant Parade and Flock Together. Elephant Parade includes 16 different interpretations of an elephant- headed female form. Dodson says the elephant represents power, sensitivity, strength and wisdom, and these elephants are feminine archetypes – goddess figures. The Hindu elephant god Ganesh inspires her work. Ganesh is a male deity. All of Dodson’s carved sculptures are female. 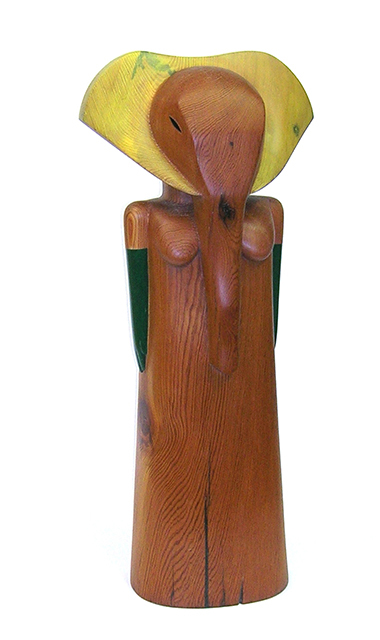 The image above is titled Elephant Princess, 20” tall, wood, pigment, paint (2008). Notice the tusks are painted a delicate red. I asked Dodson to tell me about the wood she uses and where she gets it. She works with hardwoods and uses logs of osage orange from her grandfather’s farm in Illinois. She says her friends usually bring her wood that has been cut down, or fallen in storms, and people contact her who are tearing down old houses, and ask if she can use or recycle old wood. Most of her figures are carved from a single piece of wood. She liberates the figure from the log and often adds color to carved sections to indicate eyes, gloves, tusks, beaks, or other anatomical elements. She sculpts with a chainsaw, works with a belt sander, and uses chisels, rasps and files. Sculpture gets a smooth surface with sandpaper and is sometimes embellished with paint or pigment and then finished in varnish and wax. The large sculptures range from one to four feet tall and one to two feet in diameter. I asked Dodson about the small works on pedestals. She said the small 3D prints, bronzes and glass castings seen on the pedestals at the Fair were made from image files of the Elephant Princess, Asian Elephant, Pregnant Kangaroo, and another Striding Rhino piece, that is sold. 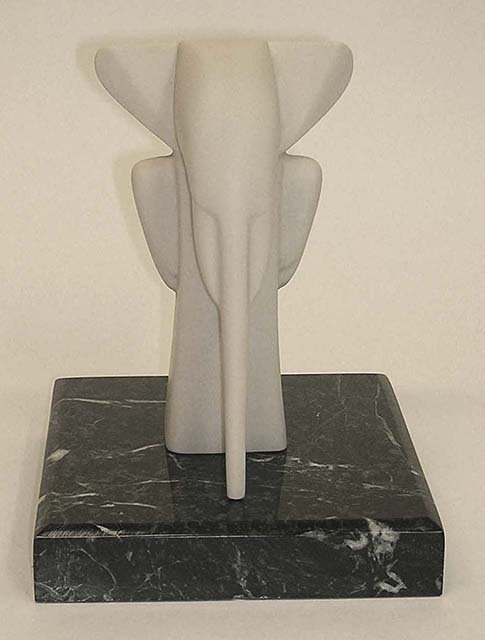 The small white sculpture above is titled Elephant Princess. It’s a 3D computer print on marble base. Limited edition of 10. 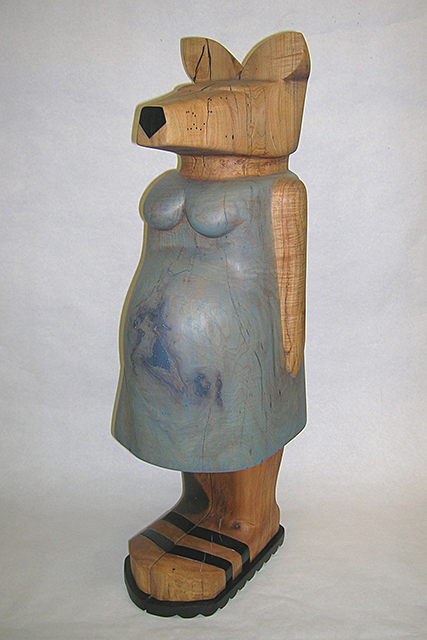 6” tall (2010). Dodson explained her 3D printing and casting process: She brings the large wood sculptures to a lab that scans each piece to create a 3D digital image file. The lab manipulates the file and creates a 3D print that becomes her 6″ white miniature sculpture. For her cast bronze and glass pieces, Dodson makes a two-part rubber mold from the 3D prints, pours in waxes, and casts small sculpture from them. She said she was excited to work with bronze and stone, and 3D computer prints. It gave her the opportunity to work in small scale and create variations in other media. My favorite of all the small works is the pink glass sculpture- and the way it plays with light. The image above is titled Elephant Matador, 21” tall, wood, pigment, paint (2008). Notice she has white tusks and is wearing red gloves. 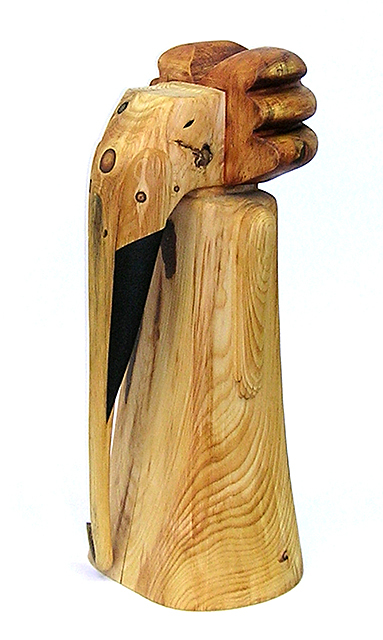 This slim, solemn carved wood sculpture stands on a black base. The image above is titled Elephant Clown, 26” tall, wood, pigment, paint (2009). Notice the swirling wood grain in her curled, carved headdress. 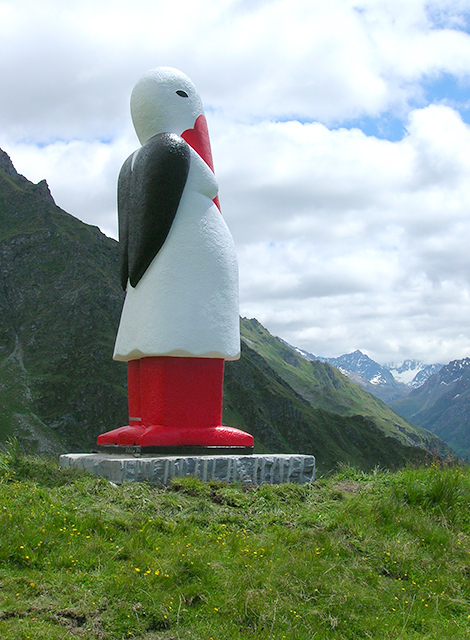 The image above is a large outdoor sculpture titled Baby Bringer (12’ tall) that is sited in Switzerland. Completed in 2011, it’s Dodson’s largest sculpture to date and is constructed with Styrofoam, cement and paint. Dodson created Baby Bringer at the Verbier 3D Foundation’s Artist Residency and Sculpture Park in the Swiss Alps. Read more about her residency here. Dodson currently has work in a group show called Visions/Visiones curated by Nora Valdez with members of the Boston Sculptors Gallery and notable Peruvian Artists at the Museo Convento Santo Domingo Qorikancha in Cusco Peru. 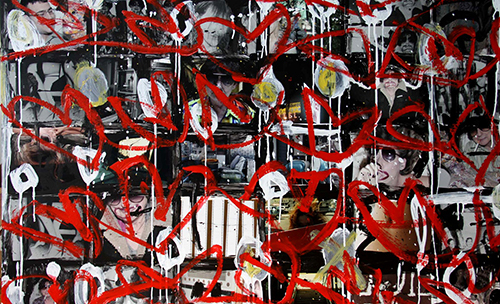 On April 30, 2014 Dodson will have her work at the ISC (International Sculpture Center) sale during the ISC Gala in NYC. The ceremony will present Judy Pfaff and Ursula Von Rydingsvaard with lifetime achievement awards. Read more here. Dodson has work in two current shows in MA: A Celebration of Woodcarving from Students of Joseph Wheelwright 1980 – 2014, at ARC in Peabody, and in the windows of Boston Sculptors Gallery. Her work will be included in the 10th Biennial Sculpture Invitational at Krasi Art Center in MI. Read more here. 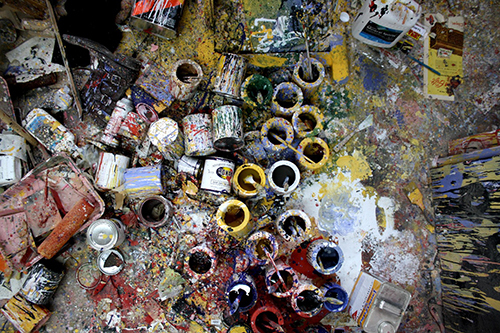 May 3, Dodson will debut at the Rice Polak Gallery, Provincetown, MA, in a group show of all gallery artists. Read more here. 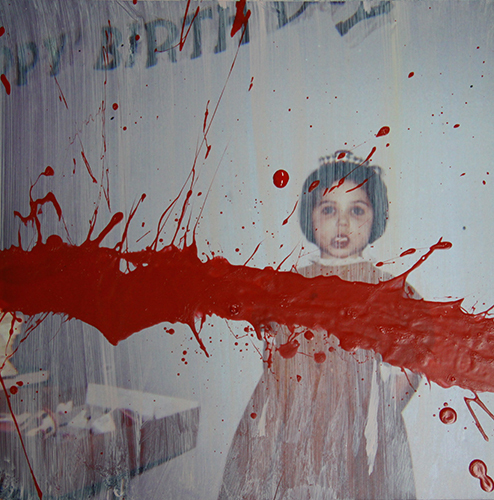 Her solo show, Silent Scream, at the Boston Sculptors Gallery is scheduled for May/June 2014. Read more here. In June she will participate in a three person show at the Essex Art Center in Lawrence MA. In July, she has a solo show at the Carving Studio and Sculpture Center in West Rutland VT.
Read comments Dodson writes each month about upcoming exhibitions and see more of her work here. It was my pleasure to meet Donna Dodson and Stephan Fowlkes at the Fountain Art Fair 2014. I thank Donna for sharing comments about her work and her media and for sharing the image files seen here. I look forward to reading her blog and seeing more of her work again in person. She has an incredible exhibition itinerary coming up. If you are in MA, VT or MI, try to see her work in person. What a surprise! Children’s art on view in a pristine Chelsea gallery space. 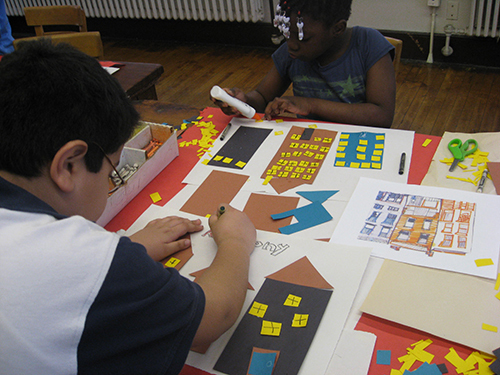 I visited the DC Moore Gallery on West 22nd Street in NYC last month and saw an exhibition with collage done by children. The main gallery had wonderful paintings by Eric Aho. 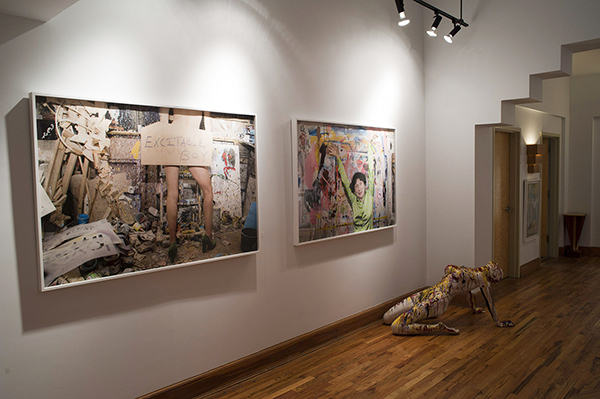 The adjacent gallery had an installation with 31 collages by students at the Calhoun School in NYC, titled 9/11: Through Young Eyes (September 8 – October 8, 2011). The works were done 10 years ago. The students were 8th graders. Read more. My first reaction was – isn’t this interesting to see collage by young students in a Chelsea gallery. My next reaction was that the student’s works looked really good. I wanted to get up close and see the way the collages were made, the materials that were used, and understand why the work looked so good. When I walked around and looked at the individual works, I noticed they were made with pieces of cut construction papers pasted on top of another piece of colored construction paper. This is the stuff that children use for art projects in elementary school. The paper is not that special. But the works looked almost professional. I analyzed what made the works seem so special. The answer: every work, no matter what background color of construction paper was used, was “floated” on the same warm white paper – a high quality background paper – and framed in a matching white wood frame. All the frames were the same size, and each one was hung with just the right amount of space between. Every framed work had room to breath. Each work got the gallery treatment. Seeing the exhibition made me think how art can be enhanced by optimum presentation and installation. I also thought about art made by even younger children I ‘ve taught at an after-school program at the Williams Elementary School in Mt. Vernon, NY, organized through the Pelham Art Center, Pelham, NY. I will teach collage again at the Williams School in December 2011. 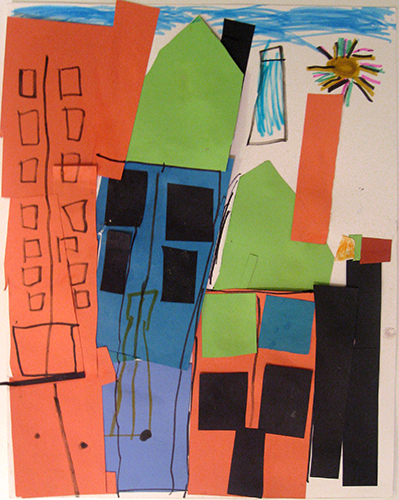 The images below are collages done by 2nd graders, inspired by Romare Bearden (African-American 1911-1988). I showed them a small print reproduction of a Bearden work titled “The Block.” It’s 48 x 216 inches, six panels, cut and pasted printed, colored and metallic papers, photostats, pencil, ink, gouache, watercolor pen and ink on Masonite. The image below is a section. 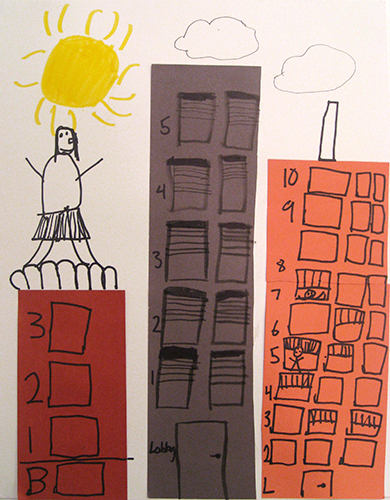 I also brought reproductions of Bearden’s much simpler line drawings to inspire the students at the Williams School. 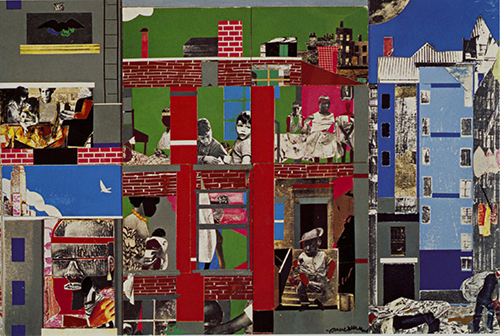 The image nearby is a drawing by Romare Bearden. Image: the Internet. 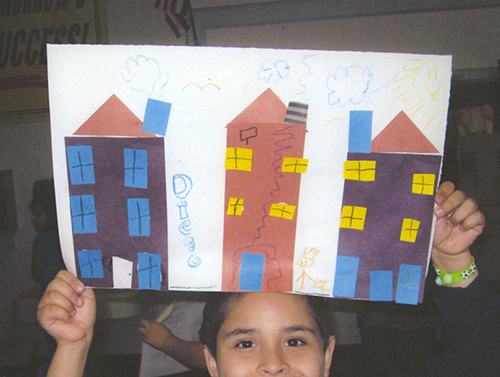 The after-school program at the Williams School is self-selected. That means the kids decide what activity they want to join. My activity is making art with paper collage. 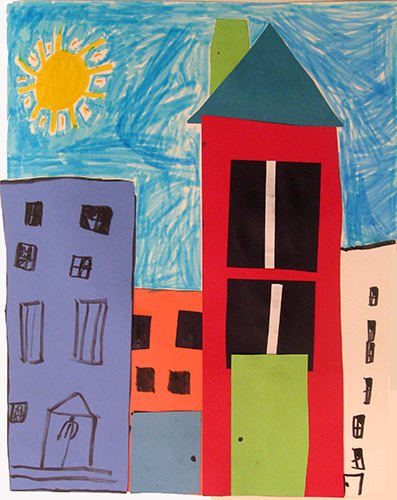 The school has a very good art program and the children know how to work with scissors, paper and glue. I bring drawing paper for the substrate (bottom collage paper) and assorted papers. I bring scissors, glue and crayons and encourage the students to embellish the papers with drawings, patterns and more color. 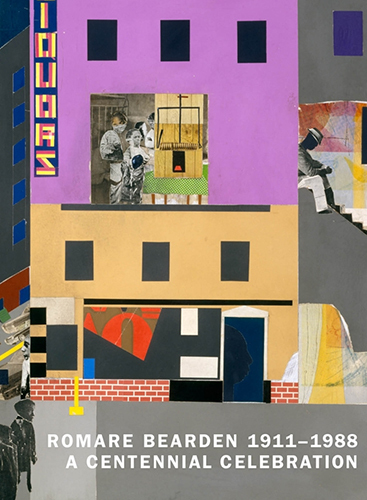 At the beginning of the class I show a reproduction in color of Bearden’s collage and drawings and say Bearden was a famous artist with works in important museums. I ask them to raise their hands if they know what a collage is. All hands go up. I ask them to look at the windows in the classroom and see how the spaces are divided. 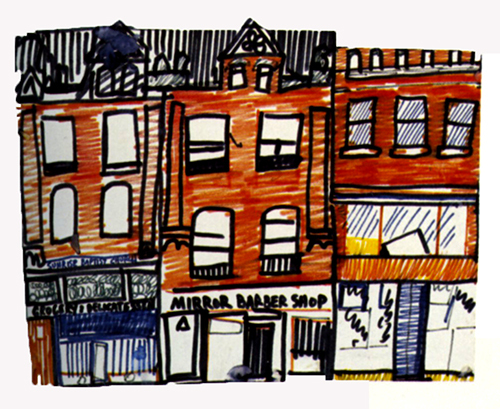 I ask them to notice how the windows in the 3 different Bearden line drawings each have different windows, and to notice that some windows have people looking out. Making art is about learning to see. 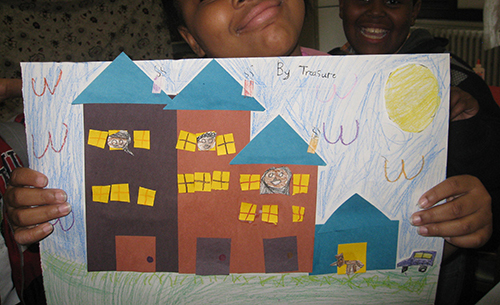 I ask the students to make a collage like the Bearden drawings and have more than one house on a street. The Bearden reproductions include people and cats in the window. The children drew puppies, kittens, birds, trees, flowers, boys and girls. Because time is short and the students have different skill levels, I prepare a lot of the collage papers in advance and pre-cut papers into 3 sizes of squares and rectangle in brown, yellow, black and teal blue papers. Each student gets a small squeeze bottle of white glue and a pair of children’s scissors. I leave some papers uncut, and encourage the students who want to be independent and inventive to cut squares into rectangles for doors, steps, chimneys and long windows, and cut squares into triangles for rooftops. I always do a tutorial on how to carefully squeeze glue from the small bottles. I say do “dot dot dot” and don’t squeeze too hard. I am there to help clean up the glue puddles if they squeeze the bottle too hard. I am amazed at the energy in the works. Even if they don’t cut squares into smaller pieces, or cut parallel edges, each work is fun and joyful, based on the ways the papers are placed and the drawings they add. Everyone is able to finish his or her work. 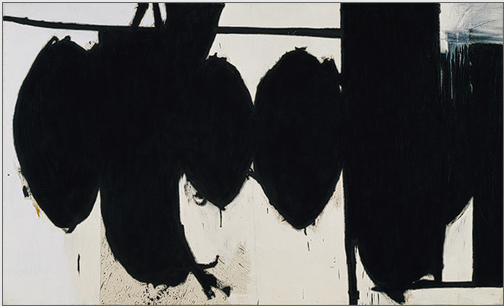 The images show student works in progress and works held up for admiration. I didn’t show all the children’s faces to protect their privacy. 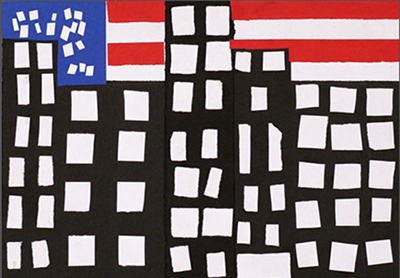 The thirteen-year-old students in the exhibition “9/11” made their art after a visit to the Whitney Museum of American Art to see an exhibition of works by Jacob Lawrence, including his “Migration Series” (1940-41). The Migration Series is about movement of African-Americans from the agricultural South to the industrial North following World War I. 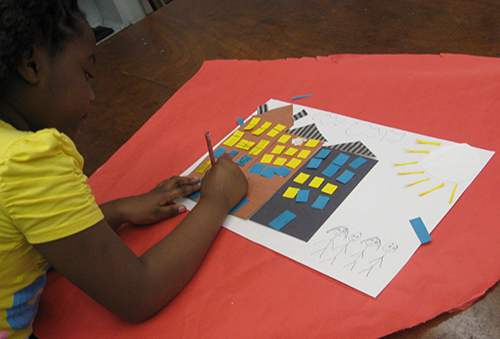 Thank you for your comments about children making art with collage.